Molly Land has been writing Web content for almost 10 years. She worked as a registered respiratory therapist for over 20 years and now enjoys writing articles on health and other topics for various online publications, as well as private clients. She received her respiratory therapy degree from Vincennes University. 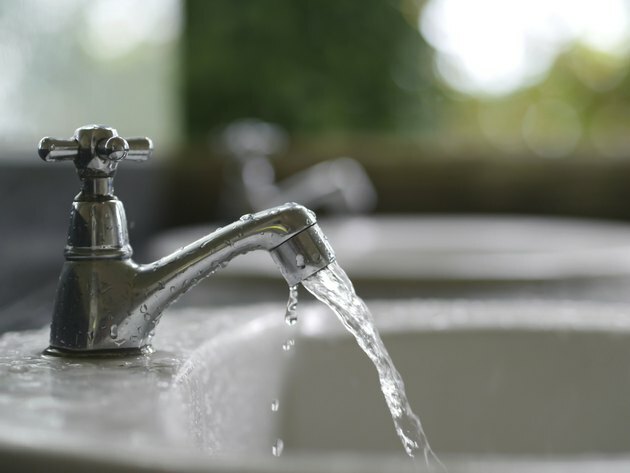 Iron in drinking water is not considered a health hazard but it can impart a bad taste and leave an unsightly residue, according to the Wisconsin Department of Natural Resources. Iron is usually not a problem in municipal water supplies but if you rely on well water, you may need to install a water filter to remove excess iron. A water filter that removes iron from your water supply is usually a whole house filter installed at the water main. This removes iron before the water reaches any of your faucets or plumbing. Iron can leave behind a residue at any point in your home where you use water, including the washing machine or toilet. For that reason, whole house filters are used for removing iron rather than using point-of-use filters under the sink. Iron can be removed with sediment filters, water softeners and carbon filters but the iron can clog these systems quickly, according to the Minnesota Department of Health. To reduce iron, a manganese greensand filter is commonly used. These filters are sometimes combined with aeration or the addition of chlorine for more thorough water treatment. Iron water filters improve the aesthetic quality of your water. The two types of iron are soluble and insoluble. Soluble iron leaves behind a reddish brown residue in glasses and on sinks. With insoluble iron, the water can take on a rusty red or yellow color that makes it look unappealing. This residue usually has a metallic taste that can affect beverages and food prepared with the water. Iron water filters remove the residue so your water is clear and better tasting. Iron can build up in plumbing and appliances, including water heaters and water softeners, according to the Virginia Cooperative Extension. This causes them to be less efficient and may shorten their life spans. In addition, iron can leave reddish brown stains on dishes, laundry, and porcelain sinks. Iron water filters eliminate these problems and that could save you money over time. Whole house iron filters are designed to remove iron and other minerals, including manganese, but they do not have a small enough pore size to remove dangerous microbes. An additional point-of-use water filter may be needed for drinking water in addition to using an iron filter. However, according to the Virginia Cooperative Extension, reducing the amount of iron in your water diminishes the risk of contamination by bacteria that thrive on iron.